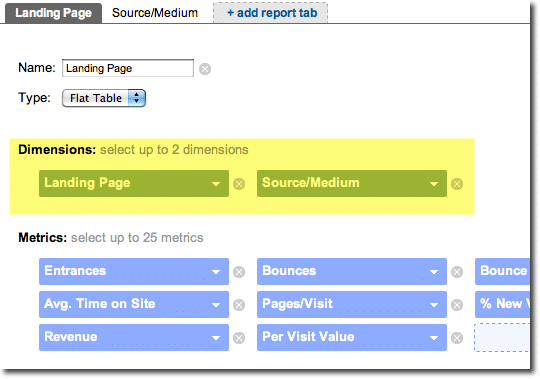 Custom Reports in Google Analytics Version 5 (v5): What's New? Blog Home › Analytics › Google Analytics › Google Analytics V5 Custom Reports: What’s New? Google has dramatically increased the power of Custom Reports, in the public beta release of Google Analytics v5 (Version 5). If you find yourself looking at multiple reports to draw insights or commonly filtering reports to get the right view of your data, then you’ll want to use Custom Reports in Google Analytics. We recommend that you build custom reports focused on goals and outcomes. You will find that the standard reports in Google Analytics either lack goal and ecommerce conversion data or they exist on another tab, which makes it difficult to see the appropriate metrics side-by-side. Google has built a great tool that has a number of default reports, but every business is different and they have to create default reports that satisfy the bulk of users versus your individual company — so don’t stop at what Google gives you and instead learn how to leverage and build Custom Reports. What’s New in v5 Custom Reports? In the past, I’ve built the report for them and then either filtered the report to include the product pages and added to their dashboard (which saves the filter), or I’ve provided them instructions on how to filter it themselves using complicated regular expressions. This is now much improved with the new custom report filters. Further, it is not limited to filtering on the selected dimensions included in the report. As an example, you can create a report that includes ‘Landing Page’ as the report dimension and apply a report filter that looks for a specific value in custom variable slot #3. You can also add multiple filters to a report. In Google Analytics v5, there is now an option to choose the table type in the report. The table view you are accustomed to using in v4 is called “Explorer.” In the Explorer view, you can drill down to another dimension if you have your report configured as such. Within the Explorer view, you can have multiple metric groups. Each metric group has the same dimensions but can have a different list of metrics to show. Continuing with the theme of granting more control over building custom reports and making them more customizable, Google Analytics now has the ability to specify different dimensions on each tab of the custom report as well as different table types (flat table or explorer) per tab. Landing Page – This extends the built-in landing page report to also show me average time on site, pages/visit, % new visits, revenue, and per visit value. This is a flat table view that also includes the source/medium so that I can see how landing page performance from various source/mediums perform. Source/Medium – This is an explorer type table view (so I’ll be able to drill down from source/medium to visitor type to view my data). 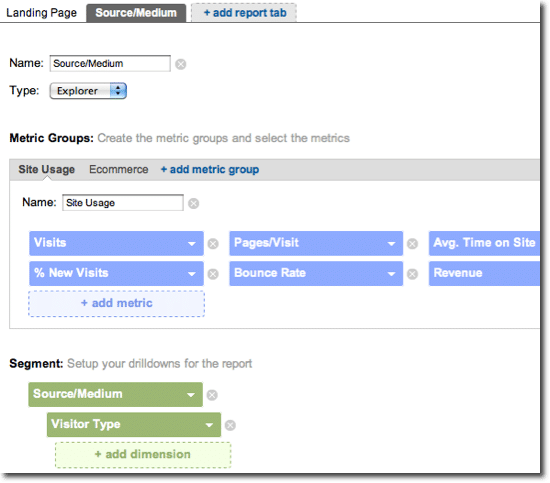 I have two metric groups, “Site Usage” and “Ecommerce.” Each is configured with several metrics that I want to see. I’ve even included Revenue on each of the tabs since that is important for me to understand from a source/medium perspective. On the Landing Page tab, I can quickly understand where people are landing, where they are coming from, and how much revenue was made from the landing page and source/medium combination. 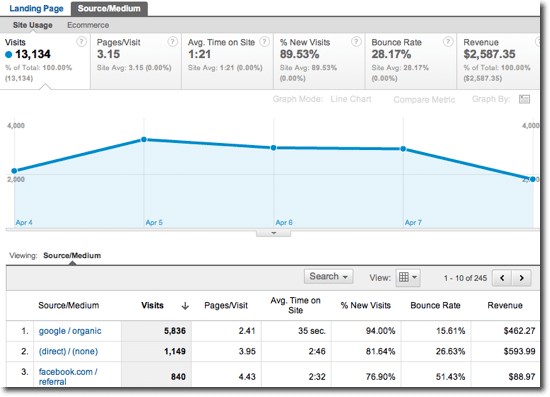 I can also see the bounce rate, time on site, and other metrics that are important to me. For this particular client, I have a custom profile created that uses several filters to rewrite all category pages, product pages, etc to distinct page URIs. That way, I can easily see an overview of these how these “page types” perform. A blog post on this technique will be written in the future. On the Source/Medium tab, I’m more interested in the performance of each source/medium. As such, that is my primary dimension (though I can also drill down to the Visitor Type dimension to understand if these are new or return visitors). Each metric group has a different set of metrics. What’s Missing in v5 Custom Reports? While this is a beta release of the new version of Google Analytics, it is only fair to point out what is currently missing. This is unlikely the final release version, so hopefully this section of this post will become outdated over time. PDF Export – This is not available globally currently. Report Emailing/Scheduling – This is also not available globally currently. Sharing – There is no option in v5 to share a report you’ve created with another user. You can share a report with another profile though. UPDATE 4/27/11: Sharing between users is now available. Reorder Metrics – When building a report, if you later want to add a metrics to the beginning of the metric list, you have to remove all current ones and re-add them one-by-one instead of just being able to reorder. Drill Down Issue – On an explorer report, if you click to drill down to a second-level dimension, there’s no easy way to get back to the parent-level dimension. The only way I’ve been able to do this is by going back to the Overview custom report listing and running the report again. Report Filters – If you have custom report filters applied to the report, after you run the report, it does not indicate anywhere in the interface what filters have already been applied. You must remember that your custom report has been filtered at the build-level. Share your thoughts on these new upgrades to custom reports and let us know if you think they deliver the power you need. If there is anything else you think is missing, let us know! Being a Google Analytics Certified Consultant we will be sure to share your input with the powers that be at Google. When done right, PDF reporting doesn’t have to be very hard to maintain. I read the post on your site regarding your letter to Google and it sounds like this might already be cleared up. We will be sure to pass along your thoughts though just in case. I love your letter to Google! Great idea, I do know that if you type their name into a place that gets indexed then they will read it. I believe the Social metrics aren’t yet available for Custom Reports either, unless I’m missing something? I actually went in to create a report around the Social Actions to mail to staff once a week and I can’t yet do either. You are correct. The new metrics collected via _trackSocial() are not yet available in custom reports. The v5 interface does not yet have the ability to schedule emailed reports. I expect both will eventually be available. Are PDF report exports and/or the email a report features available in any way at this time? Can I access them in beta for the new version of GA? We need them! PDF reports/exports are not yet available in the new version (v5) of GA. They will be available though (hopefully soon)! It irks me that the online help for GA is written as if the function to schedule email reports exists, so I spend over an hour poking around and pulling my hair only to find your blog where the word is “no”. They need to denote that the function is not available in version 5 within their help docs.